Sammy Sosa met with the Chicago Cubs' front office Friday and this much was resolved in their negotiations for a contract extension: They will keep talking. "We've agreed to continue to explore ways to find common ground in negotiations," Cubs president and general manager Andy MacPhail said after the two-hour meeting in Fort Lauderdale, Fla. 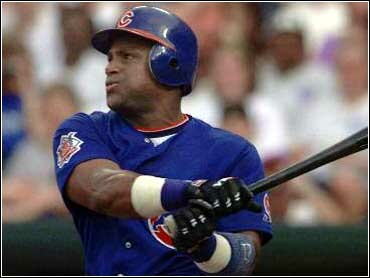 In the past, Chicago had offered its star outfielder a four-year extention at $17 million per season. Sosa's $42.5 million, four-year deal expires after this season. Sosa, 32, has hit 179 homers and driven in 437 runs during the first three years of the contract and won a National League MVP award. He is thought to be seeking a five-year extension worth $85 million to $90 million. "It was constructive," said Adam Katz, one of Sosa's agents. "There are a number of possibilities and we're considering all avenues jointly." Last summer Sosa was the subject of numerous trade rumors but deals with the Red Sox and the Yankees didn't materialize. MacPhail said the sides agreed Friday to keep their negotiations private. He hailed the face-to-face meeting "more efficient and effective rather than operating via the phone." He didn't discuss a timetable; spring training is just more than a month away. "I think essentially we will give it a good faith effort and see how it progresses," MacPhail said. "The specifics we will try to keep to ourselves." Tribune Co. executive vice president Dennis FitzSimons attended the meeting along with Tom Reich, Katz's senior partner. "It will be a problem if he doesn't sign a contract," Baylor said last month. "I really don't want the guys to be a part of what happened last year. That's what dominated the clubhouse last year: the Sosa Watch."